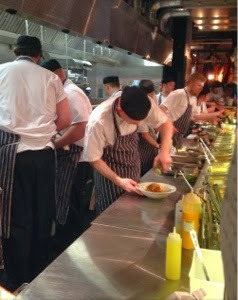 We were very excited to be invited along to road test Jamie's Italian* Newcastle before it's grand opening in March. 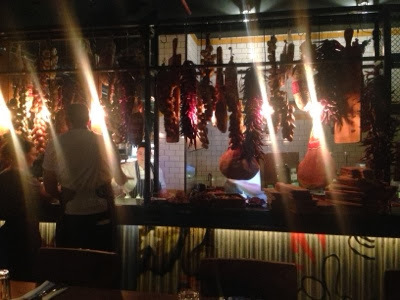 We are already huge fan's of Jamie's Italian and have previously thoroughly enjoyed meals at both York and Covent garden branches of the chain. Jamie's is situated in a prime location opposite grey's monument in the centre of Newcastle. There is plenty of outdoor seating which I expect will prove popular with coffee lovers. You enter the restaurant on the ground floor. Here there is a mix of seating from sofa's to booth's to seats at the bar. Our host explained that this area is going to be used for drinks and bar snacks and with an impressive cocktail menu and a nice selection of bar snacks I'm sure this area will become a popular meeting place in town. We were taken upstairs to the main restaurant area. 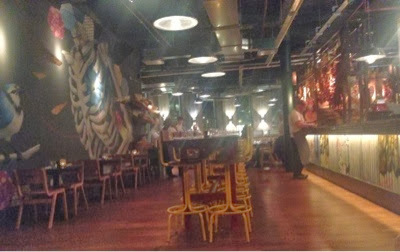 The whole feel of the restaurant just oozes Jamie Oliver's personality. 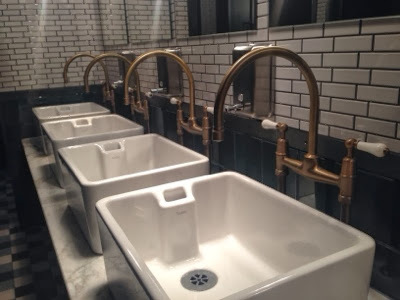 It is all very rustic and relaxed with quirky industrial twists. We walked past the open kitchen and were seated near the antipasti bar where we could watch the talented chef's work their magic and put some amazing looking platters together. 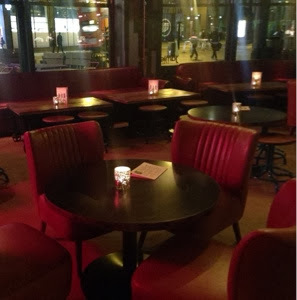 Again, there is a range of seating upstairs from intimate candle lit tables for two, to large circular tables for friends and long bar style seats perfect for even bigger groups. I don't usually pay attention to music but I have to say I loved the restaurant playlist - a fantastic eclectic mix of 80's, 90's and 00's hits - love that feeling you get when a song you used to love is played. All part of the Jamie experience! Our waitress arrived and talked us through todays specials and we ordered our drinks. At £17.50 per bottle for house wine, the wine list is perhaps on the expensive side compared to other Italian restaurants in town. However after consuming rather a lot of the house wine whilst in Covent garden I can confirm that it very drinkable and a carafe of wine at your table really adds to your night out I think! Pint's of Jamies hand picked beer selection seemed to be going down well with the group of blokes on the table next to us so also maybe worth a try. 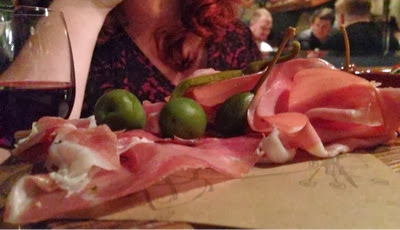 We browsed the antipasti menu and were immediately drawn the the 'meat plank'. When we dined at Jamie's Italian in York in December, the table next to us ordered one of these and I suffered from serious food envy! Priced at a very reasonable £6.95 per person, you get a real taste of Italy delivered on a plank of wood which is placed in the middle of your table to share. 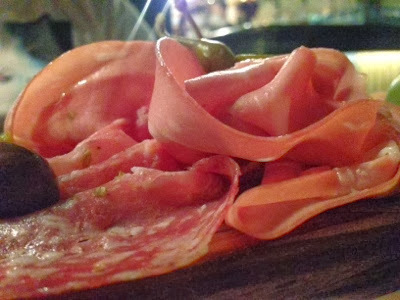 We enjoyed a selection of cured meats, cheeses, salads and pickles. 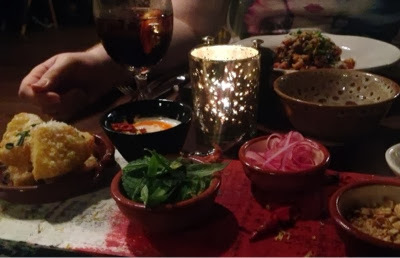 There was just the perfect amount for a starter and it gave me the chance to be a little adventurous and try food I wouldn't necessarily usually order myself. 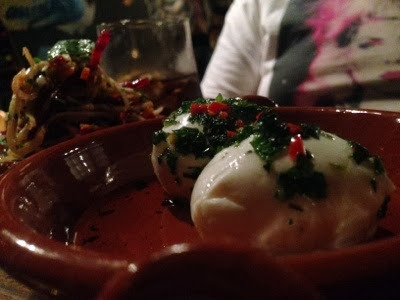 The whole platter was lovely and fresh and packed full of flavour but the buffalo mozzarella really stood out for us - it just tasted so much more full of flavour then what we have ever tasted before! We waited in anticipation for the arrival of our mains, my hubby had ordered the ragu pasta from the specials and I ordered the lamb lollipops. 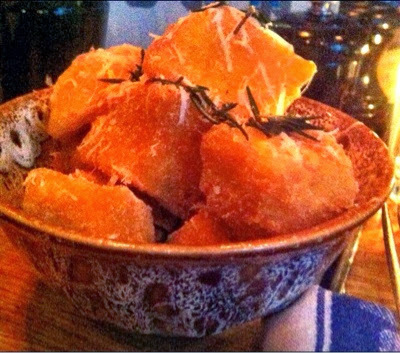 We also ordered a bowl of polenta chips as they are the nicest thing you will ever try! There is no way we could visit and not order a bowl. Pasta at Jamie's is all made in house and you really can taste the difference. You get a huge portion and priced at £10 we thought this was very good value for money. My lamb lollipops were something else though! Hands down the best lamb I have ever tasted! Priced at £17.95, they were one of the more expensive dishes on the menu. You really do get what you pay for though and I would happily pay this price again. The British lamb chops are grilled under a brick and served with a pickled mint, tarragon & red onion salad, toasted nuts & a lemony yoghurt dressing and a smaller side of polenta chips. The idea is to dip your lamb lollipops into the various toppings and enjoy (finger bowls and napkins are provided so don't be scared to use your fingers). The lamb was succulent, juicy and full of flavour and I really can't rave about it enough. The portion was large as well - I donated a whole chop to hubby and was still satisfied. 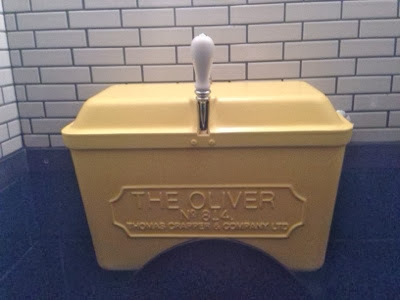 I wouldn't normally blog about loo's but Jamie's loo's have a reputation of being something special and I couldn't not post a pic! After a bit of a rest, we took a look at the dessert menu. Tiramisu is a signature dish (made fresh every day with Gennaro's own recipe) but we decided to save this for another time. 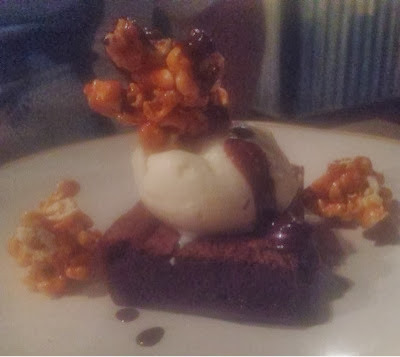 Hubby ordered the Epic brownie which was soft and gooey as you'd imagine and served with amaretto ice cream and caramelised amaretto popcorn which was a wonderful combination. 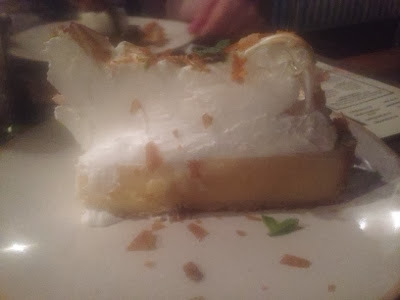 I opted for the Lemon meringue pie which was epic! 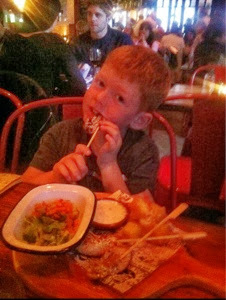 Although we were child free during our visit this time, we have visited Jamie's Italian with our children in the past. I really cannot rave about the fantastic children's menu enough. I wish more restaurants would take a leaf out of their book and take the same sort of thought and care over their children's menu as Jamie's Italian do. All dishes are nutritionally balanced, use cooking methods that reduce fats, oils and salts, are made from scratch and use ORGANIC, SUSTAINABLE meat, fish and vegetables! Wow! Not many restaurants can say that. Priced at £5.95 for a main, shake me salad and fresh juice this is fantastic value. Dessert can be added for 50p. Our 7 year old has previously enjoyed chicken lollipops and said they were one of the nicest meals he has ever eaten so thumbs up from him. 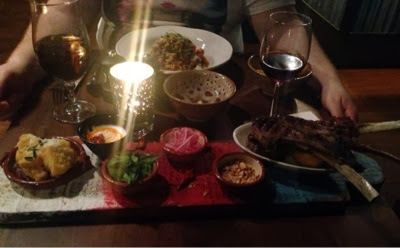 We left Jamie's Italian feeling full of delicious food and very happy. I would recommend it as the perfect place to meet friends, enjoy a family meal, date night or business lunch with colleagues. 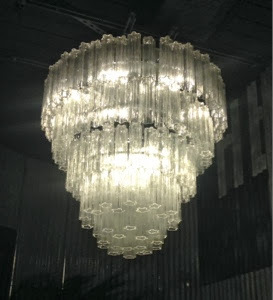 The atmosphere is very sociable, relaxed and friendly and nobody would feel out of place. We can't wait to go back. 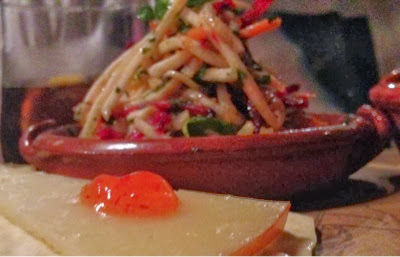 Ps - Check out the Jamie's Italian website and join their gold club for free. This will entitle you to lots of treats including complimentary tasters every time you visit and invitations to exclusive events and tastings.